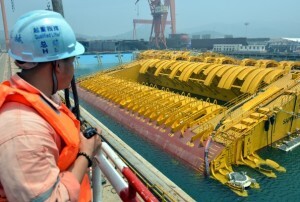 The world’s largest deep-sea engineering equipment built by a Chinese firm has been delivered to its Brazilian client. China’s Wuchang Shipbuilding Co delivered four sets of buoys and 16 sets of foundations to Brazilian oil company Petrobras. The equipment will be installed on an offshore oilfield in Brazil. The deal is part of the Sapinhoa-Lula NE BSR Buoys & Foundations Project. The equipment is able to fit in a deeper and more complicated marine environment enlarging the scope of offshore oil exploitation, according to Victor Bomfim, senior vice president of the project contractor Subsea 7 SA. Peter Wang, managing director of Eastern Horizon Consultant said the delivery indicates that China is now capable of building high-end deep-sea engineering equipment.